I think Ohio skipped spring this year. It went from frigid temperatures to brutal heat. With the heat comes the humidity. For a curly haired girl, this is not a good thing at all! I straighten my hair almost all of the time, so a little humidity can lead to big frizz. My hair is also frizzy because of my highlights and damaged hair, so it needed some extra love. I was recently sent two products to help combat my frizz, and I loved them so much that I'm offering a giveaway for you! 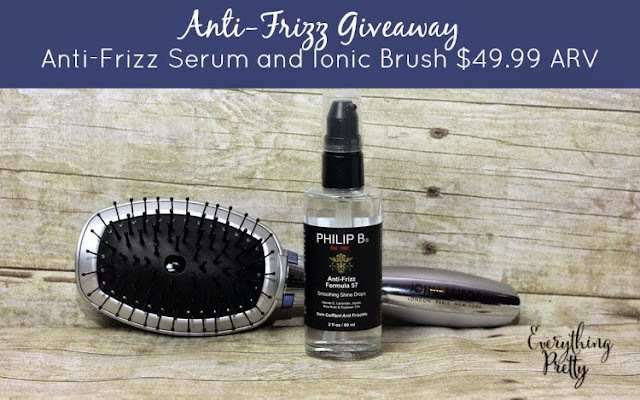 I've used a few anti-frizz serums, but I have to say that the Philip B. Anti Frizz Formula 57 has been my favorite. I used it just after straightening my hair, and it really made it softer and smoother. It has natural ingredients like jojoa oil, vitamin E, rise bran, and lavender to smooth hair. The light formula locks out humidity, so I could get two full days out of my style. Best of all? It's phthalate and paraben free! The John Frieda Sleek Finish Hair Brush is very unique because it releases ions to help smooth the cuticles on your hair, which reduces frizz and leaves your hair shinier and healthier looking. 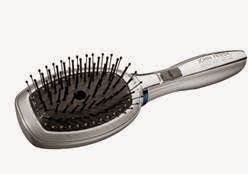 The bristles are made of silicone to control flyaways and make your hair shine. I'll be honest, I was skeptical of this brush. I was also very intrigued, so I gave it a try. I was very surprised to see such a difference in my hair. It has an on/off switch, so I used it without turning it on and didn't see a difference. Then I turned it on and ran it through my hair, and it really did reduce flyaways and help my hair lay down better. I also used it on my daughter. She's 7-years-old and still has baby fine hair. It also helped her hair look better and lay better. I tried the paddle brush. The bristles were a little too stiff for my liking, so I just used it to finish my style and used my regular brush for styling. I like to clean my brushes regularly, so I was glad that it comes apart so easily. Gently pull on the top, and it comes right off to clean. Want to try them out? I'm giving away one serum and one brush to one lucky winner with a United States shipping address! This is a $49.99 value. Good luck!